Wouldn't your family love to sit down to my Stir Fried Pork with Ho Fun Noodles? Cooking Chinese dishes in your home isn't difficult. Try my recipe tonight! Everyone loves Asian style dishes and they’re not as hard to make as you might think. 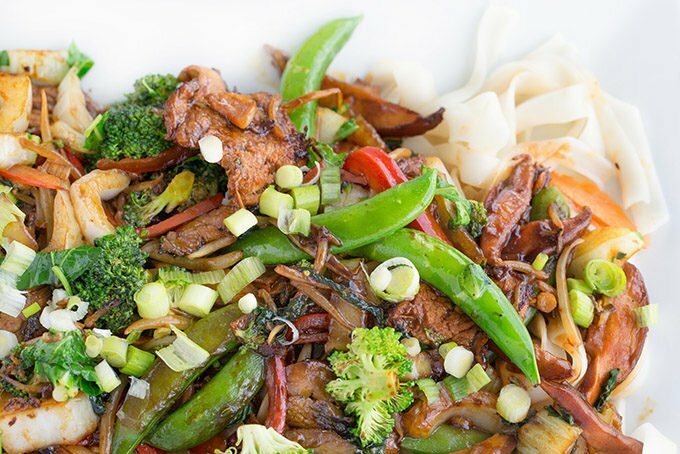 Learn how to make my favorite Stir Fried Pork with Ho Fun Noodles in your kitchen tonight. This post is sponsored by Argo Corn Starch. All opinions, recipe and images are 100% mine. Years ago I had my very first Ho Fun noodle dish, and its an item I look for on every Chinese restaurant menu. 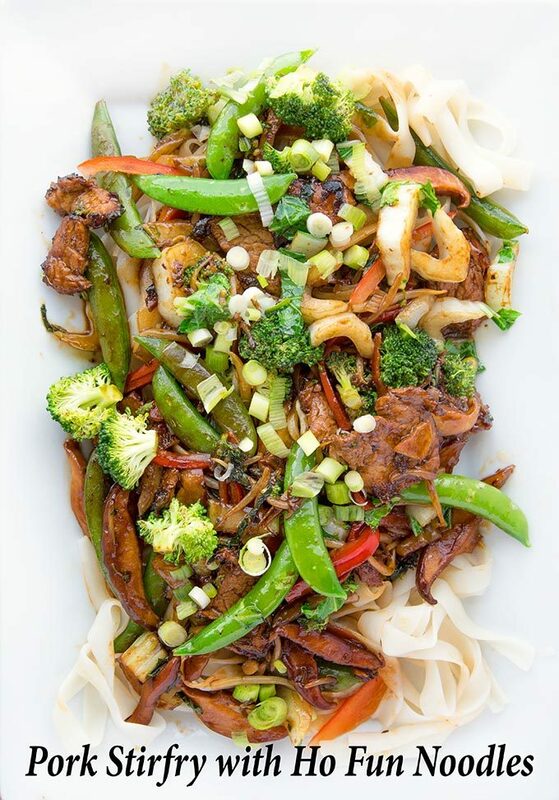 Those lovely gluten-free noodles pair so well with a stir fry, adding more substance to the dish. And who doesn’t love noodles? The only tricky part of any Asian inspired dish is how the sauce is thickened. Corn starch is the key ingredient in thickening the sauces that take minutes to make and explode with flavor! But you can’t use just any corn starch and that’s why you’ll always find Argo® Corn Starch in my pantry. 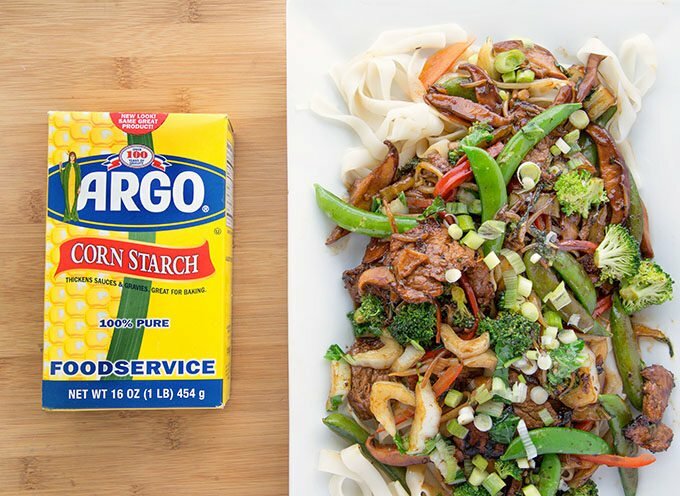 Argo Corn Starch ensures smooth, clear sauces, lump-free gravies, and reliable thickening – in fact, it has twice the thickening power of flour. It dissolves easily and it’s flavorless so it never alters the taste of the recipe. And unlike flour, Argo Corn Starch is Gluten Free. Before I start cooking any dish I make in my kitchen, I get all my ingredients together. This is called the mise en place (everything in its place). This not only speeds up the cooking process but ensures that I have all the ingredients necessary to make the dish I’m preparing. There’s nothing worse than finding out you don’t have something you need in the middle of cooking! These are the first ingredients I’ll be using, velveting the pork. 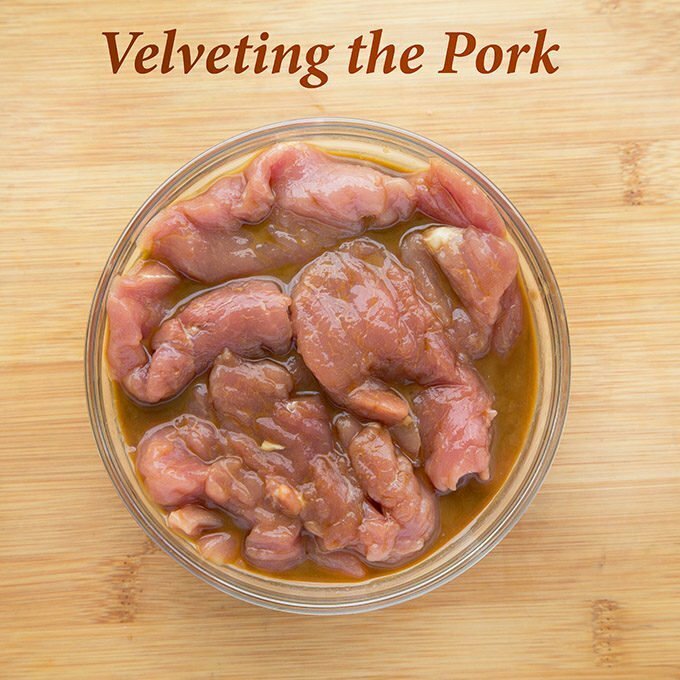 Velveting is a technique in Chinese cuisine for preserving the moisture of meat while cooking. Additionally, it provides a soft or “velvety” texture to the meat of any entrée. The technique is applied to raw meat before cooking either in oil or in water. It involves pre-coating the meat with a mixture of oil, corn starch, rice wine and soy sauce ( some recipes call for egg whites). The meat can then be sautéed, stir-fried, deep-fried, simmered, or boiled. During cooking, the velveting mixture also protects the meat fibers, preventing them from seizing, resulting in more tender meat. 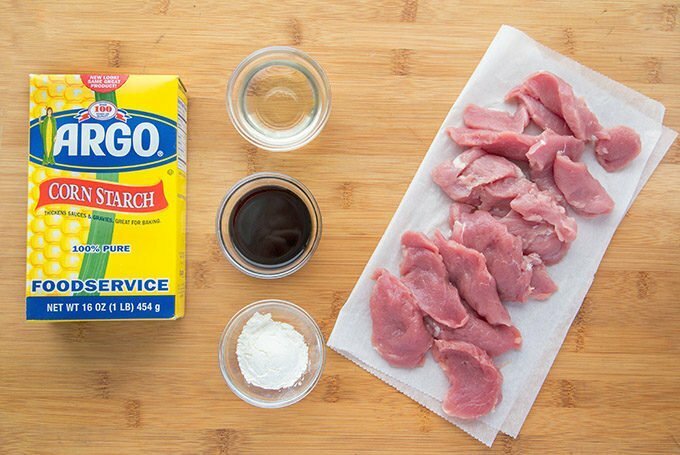 The most important ingredient of any velveting marinade is the cornstarch, and that’s why I always use Argo Corn Starch. The other ingredients can vary depending upon whose recipe you’re using. But they all include corn starch and that my friends is non-negotiable. If you’ve never tried the velveting process you’re going to be surprised to see just how easy it is to do and how much of difference it makes in the dish. That’s why it’s important to use the best quality corn starch you can find so it mixes well with the other ingredients creating deliciousness time after time. Did I mention I use Argo Corn Starch? In the picture above the pork is in the velveting mixture. Keep it in the refrigerator until you’re ready to cook. The trick to Chinese cooking is simply in having the right ingredients. Most supermarkets sell everything you need to create your own Chinese favorites, and if they don’t you can usually find an Asian market in your area. 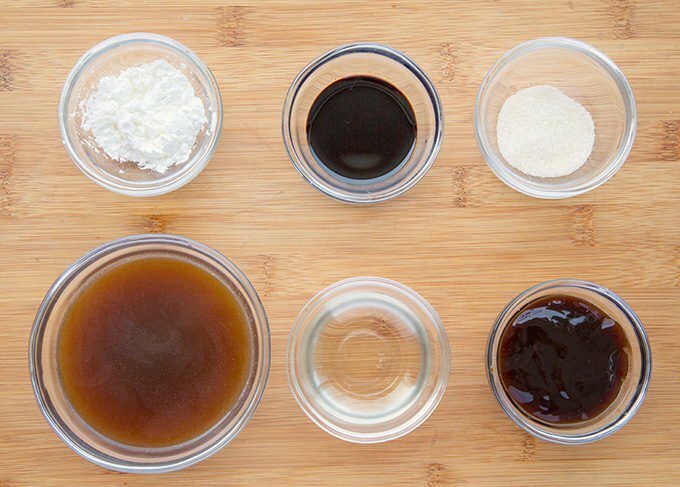 The mise en place for the sauce has a few ingredients that might be unfamiliar to you, like oyster sauce and dark soy sauce. But they do make a difference so look for both of those items and keep them on hand. 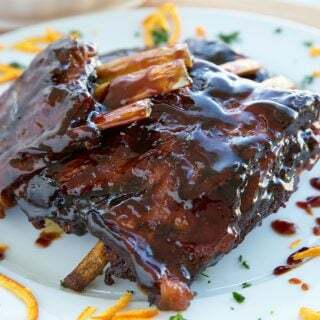 The other ingredients are easy, beef stock, rice wine, sugar and of course Argo® Corn Starch. What are Ho Fun Noodles? Ho fun (He fun, shahe fun, chow fun) is a wide flat rice noodle, popular in Southern China, especially in Guangdong province. 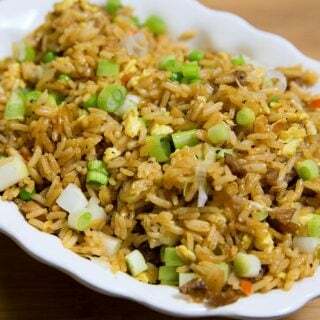 It is normally stir-fried with meat or vegetables. 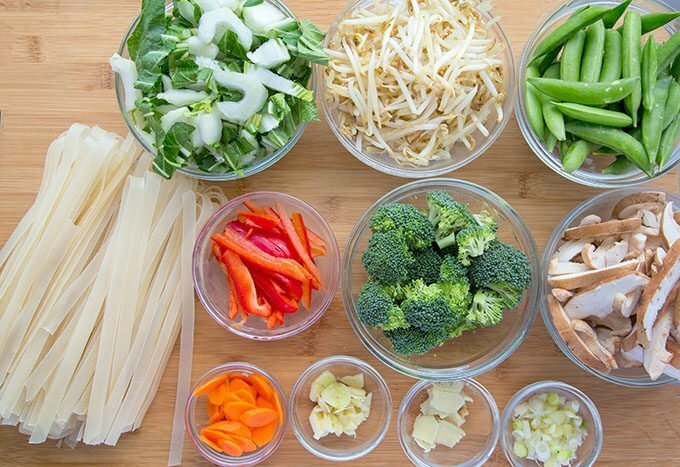 Let’s gather the ingredients (mise en place) for our Pork stir fry with Ho Fun Noodles. Here’s where you can have some fun, swapping out the vegetables for your favorites. Remember that recipes are guidelines and don’t be afraid to color outside the (guide)lines. Stir frying is a Chinese cooking technique in which ingredients are fried in a small amount of very hot oil while being stirred in a wok. I do have a wok but almost never drag it out to cook, so feel free to use a large saute pan as I did. A wok will make it easier but isn’t a deal breaker. It’s all about the sauce and a fast cooking process. That’s why it’s important to have your ingredients ready to go before you start. And quality ingredients help you be more successful in creating deliciousness in your own kitchen. I do love Ho Fun noodles but this dish would go equally as well on a bed of jasmine rice. 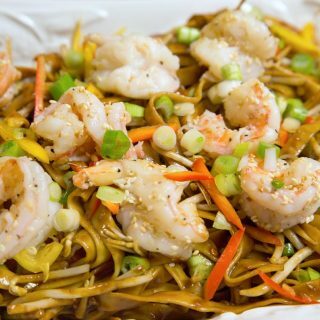 Wouldn’t your family love to sit down to this delicious Chinese dish? And it’s quicker and a lot less expensive than ordering out! Cooking doesn’t need to be difficult and having control over the ingredients you use, makes the process even more important. I love to know what’s in the food I’m eating, don’t you? 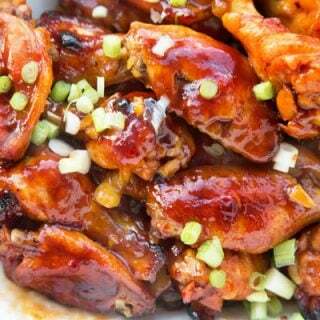 If you enjoyed this recipe make sure to check out my Chinese Sticky Wings, they are finger licking good! Add pork to the mixture, mixing well and allow to marinate for 20 minutes. Mix sauce ingredients the in another bowl. Heat Mazola Corn oil in a wok or large saute pan over high heat until it begins to shimmer. It should be about 350 degrees. Add the pork to the pan and quickly fry it for 1-2 minutes until pork is almost done and the exterior has turned nicely brown. Remove the pork from the pan and place over a wire grate to allow it to drain. Pour the oil out of the pan, reserving 2 tablespoons. Rinse the pan with water, getting rid of any excess residue by scraping the pan. Dry pan and return to set aside till needed. After the noodles have started cooking place the saute pan back on the stove and finish the stir fry. 10. Add the 2 tablespoons of oil back to the pan. Add in ginger, garlic and scallions (white). Saute for about 45 seconds until fragrant. 11. Return the pork to pan along with vegetables. Saute for about 1-2 minute then add in the sauce mixture. That stir fried pork looks delicious I love it, Whenever I visit your blog get learn something new. Today I learned about Velvet ting. Thanks for sharing. This is wholesome with pork and veggies. I never heard of velveting before but it sounds like a good idea! I am going to try it out the next time I cook. I always keep cornstarch in my pantry. For as long as I can remember all I have ever bought is Argo. I keep cornstarch in the pantry. It really is versatile for cooking and cleaning. Argo is the only brand I trust. My grandma used it and my great grandma used it so it’s been around for generations in my family. This dish is so perfect. It has all the ingredients that one’s need! I love how is packed with veggies! Looks so tasty! Yum! 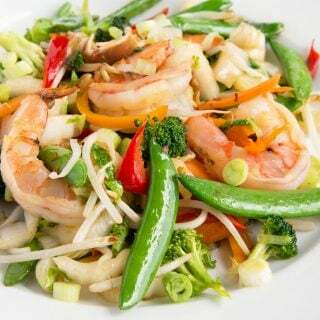 Stir fry is one of my favorite meals! I love that it’s quick to cook, but so flavorful! I need to practice your “everything in place” mantra, since I’ve recently had several meals where I was making substitutions halfway through! Thank you for sharing your technique. This looks so yummy and like something I might actually be able to do! Mmm, your photos are delicious and now I want a plate of my own. 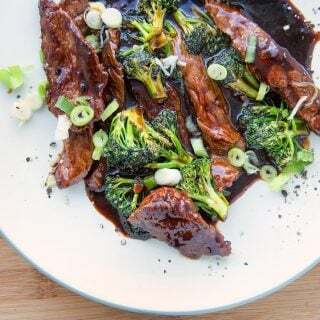 Will have to try this recipe at home as everyone loves a good stir-fried recipe. This dish looks so delicious. 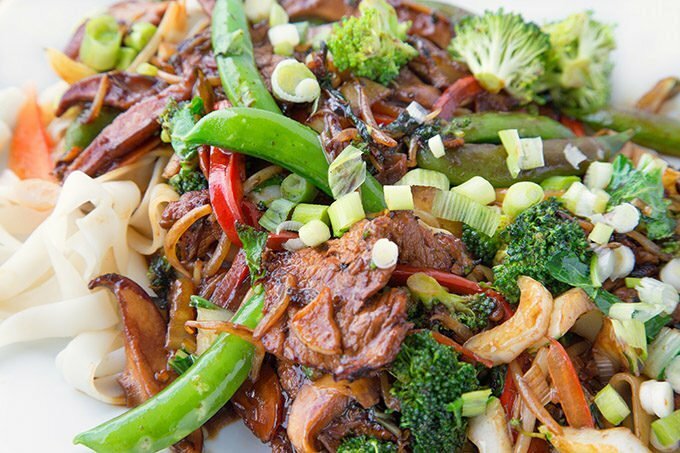 There’s nothing better than a great stir-fry and this absolutely looks the part. We are huge lovers of Chinese cuisine in our family. I’ve been trying to find a simple recipe for stir fried pork for the kids. I can’t wait to make this. This dish looks amazing. My husband loves stuff like this, I will pin this so I can try it out later for him. This recipe looks seriously amazing. Also, corn starch is a perfect staple for any cooking, and it’s so useful in the house! I am glad you mentioned the rice. I think I would like that better. I also loved learning about velveting. I cannot wait to see what a difference it will make. This recipe looks so savory. I know my family would love this. This recipe would be perfect to add to our menu for next week. I have always loved chow fun and the noodles are so tasty. I need to get to learn about this asian style marinade of my food. That looks absolutely awesome! I NEED more ideas for dinner! We are SO bored with what we eat that this would be a great change. Way to bring Chinese Take Out HOME!! Looks amazing! WAY BETTER than the typical stuff you find in the white box! yumm!! I cooked it yesterday and really love it as the great taste of spices authentic flavor. Wonderful tastiest fried pork I have ever taste. Waiting for your new recipes. Thank you Matt! I’m always happy to hear when my friends enjoy my recipes!